The Blue Brain project releases their first major paper today and boy, it’s a doozy. Including supplements, it’s over 100 pages long, including 40 figures and 6 tables. In order to properly understand everything in the paper, you have to go back and read a bunch of other papers they have released over their years that detail their methods. This is not a scientific paper: it’s a goddamn philosophical treatise on The Nature of Neural Reconstruction. The Blue Brain Project – or should I say Henry Markram? it is hard to say where the two diverge – aims to simulate absolutely everything in a complete mammalian brain. Except right now it sits at middle-ground: other simulations have replicated more neurons (Izhikevich had a model with 10^11 neurons of 21 subtypes). At the other extreme, MCell has completely reconstructed everything about a single neuron – down to the diffusion of single atoms – in a way that Blue Brain does not. The focus of Blue Brain right now is a certain level of simulation that derives from a particular mindset in neuroscience. You see, people in neuroscience work at all levels: from the individual molecules to flickering ion channels to single neurons up to networks and then whole brain regions. Markram came out of Bert Sakmann’s lab (where he discovered STDP) and has his eye on the ‘classical’ tradition that stretches back to Hodgkin and Huxley. He is measuring distributions of ion channels and spiking patterns and extending the basic Hodgkin-Huxley model into tinier compartments and ever more fractal branching patterns. In a sense, this is swimming against the headwinds of contemporary neuroscience. While plenty of people are still doing single-cell physiology, new tools that allow imaging of many neurons simultaneously in behaving animals have reshaped the direction of the field – and what we can understand about neural networks. Some very deep questions arise here: is this enough? What will this tell us and what can it not tell us? What do we mean when we say we want to simulate the brain? How much is enough? We don’t really know – though the answer to the first question is assuredly no – and we assuredly don’t know enough to even begin to answer the second set of questions. The function of the new paper is to collate in one place all of the data that they have been collecting – and it is a doozy. They report having recorded and labeled >14,000 (!!!!!) neurons from somatosensory cortex of P14 rats with full reconstruction of more than 1,000 of these neurons. That’s, uh, a lot. And they use a somewhat-convoluted terminology to describe all of these, throwing around terms like ‘m-type’ and ‘e-type’ and ‘me-type’ in order to classify the neurons. It’s something, I guess. [We compared] in silico (ed – modeled) PSPs with the corresponding in vitro (ed – measured in a slice prep) PSPs. The in silico PSPs were systematically lower (ed– our model was systematically different from the data). The results suggested that reported conductances are about 3-fold too low for excitatory connections, and 2-fold too low for inhibitory connections. And this worries me a bit; are they not trusting their own measurements when it suits them? Perhaps someone who reads the paper more closely can clarify these points. They then proceed to run these simulated neurons and perform ‘in silico experiments’. They first describe lowering the extracellular calcium level and finding that the network transitions from a regularly spiking state to a variable (asynchronous) state. And then they go, and do this experiment on biological neurons and get the same thing! That is a nice win for the model; they made a prediction and validated it. We then used the virtual slice to explore the behavior of the microcircuitry for a wide range of tonic depolarization and Ca2+ levels. 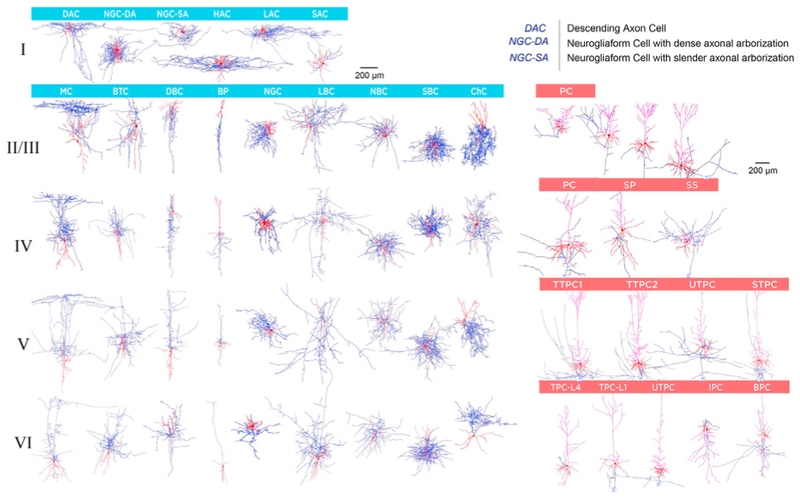 We found a spectrum of network states ranging from one extreme, where neuronal activity was largely synchronous, to another, where it was largely asynchronous. The spectrum was observed in virtual slices, constructed from all 35 individual instantiations of the microcircuit and all seven instantiations of the average microcircuit. In other words, it sounds like they might be able to find everything in their model. But on the other hand…! They fix their virtual networks and ask: do we see specific changes in our network that experiments have seen in the past? And yes, generally they do. Are we allowed to wonder how many of these experiments and predictions did they do that did not pan out? It would have been great to see a full-blown failure to understand where the model still needs to be improved. I don’t want to understand the sheer amount of work that was done here, or the wonderful collection of data that they now have available. The models that they make will be (already are?) available for anyone to download and this is going to be an invaluable resource. This is a major paper, and rightly so. On the other hand – what did I learn from this paper? I’m not sure. The network wasn’t really doing anything, it just kind of…spiked. 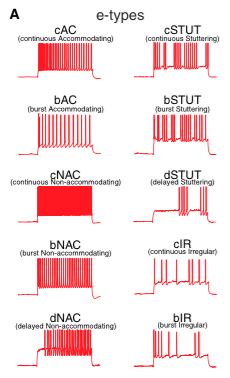 It wasn’t processing structured information like an animal’s brain would, it was just kind of sitting there, occasionally having an epileptic fit (note that at one point they do simulate thalamic input into the model, which I found to be quite interesting). This project has metamorphosed into a bit of a social conundrum for the field. Clearly, people are fascinated – I had three different people send me this paper prior to its publication, and a lot of others were quite excited and wanted access to it right away. And the broader Blue Brain Project has had a somewhat unhappy political history. A lot of people – like me! – are strong believers in computation and modeling, and would really like it see it succeed. Yet what the chunk of neuroscience that they have bitten off, and the way they have gone about it, lead many to worry. The field had been holding its breath a bit to see what Blue Brain was going to release – and I think they will need to hold their breath a bit longer.